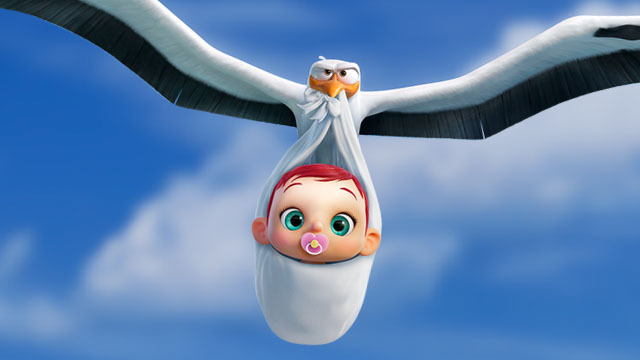 Storks is funny and lighthearted entertainment. The fact that I am 23 years old can either reflect my immaturity and slow development as an adult, or that this movie continues the trend of animated films being able to land jokes for not just children but adults as well. To be honest, the truth probably falls somewhere in the middle. Since I reviewed the trailer for Storks, I was excited to see it. The trailer delivered enough laughs in that teaser footage that I thought I would at least get my moneys worth, and I did (technically I didn’t pay, but the metaphor still applies.) Director Nicholas Stoller (Forgetting Sarah Marshall, The Muppets Movie) did a good job of balancing the pace of the story , character development, and making sure there was a steady stream of laughs. Stoller played the role of the ‘film maker’ rather than just the director, as he also wrote and produced the movie as well and this was reflected in the synergy of the film, as all aspects of the film came together. Stoller’s work was well supported by a strong cast of voice actors, with Andy Samberg (That’s My Boy, Brooklyn 99) taking the lead as the stork named Junior, who has to deliver a baby with Orphan Tulip, a human orphan voiced by Katie Crown (Total Drama). The film also features Ty Burrell (Modern Family), Jennifer Aniston (Friends), Kelsey Grammar (Fraiser), and Keegan-Michael Key, and Jordan Peele (Key & Peele). The most laughs, however, seemed to belong to one of the lesser known voice actors, Stephen Tanner Glickman (Big Time Rush), who played pigeon Toady, who cannot be described other than lamely ridiculous to the point of hilarity. It’s hard to measure comedy based on all the human variables that go into assessing if something’s funny, and it’s a very subjective practice. But Storks managed to deliver a few quotable moments, so I would consider that a key indicator of success. Stoller has used his history in more adult comedies (Get Him to the Greek, Bad Neighbours) to find a balance between entertaining kids and making the movie sincerely funny. Overall, this film lived up to the potential of its trailer, and is definitely worth the watch.